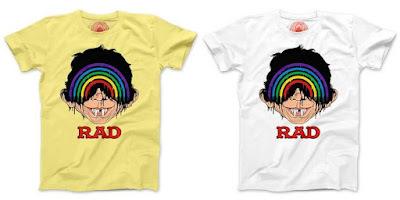 Check out this… well… rad new “RAD” t-shirt by Alex Pardee! It’s a killer mash-up of Pardee’s popular Brightmare design with MAD Magazine’s iconic mascot, Alfred E. Neuman. The Blot’s honestly not sure what’s more terrifying, Alex’ Brightmare version of Alfred E. Neuman, or the character’s normal appearance! HAHAHA! Fans can purchase this “RAD” design now at the Alex Pardee online store in three colorways. 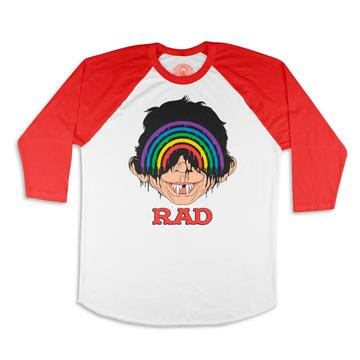 The short sleeve “RAD” t-shirt is available on a yellow shirt or a white shirt, in sizes XS-3XL, for $28, or on a white and red baseball t-shirt, in sizes XS-XXL, for $30.